Our facilities are designed to provide an atmosphere unlike most dental offices you’ve seen. The first time you enter our door, you will notice the difference. Located in La Mesa, near the Grossmont Trolley Station, you’ll find easy access and ample parking. The décor and design in this cosmetic dental office are all created to reflect the quality, comfort, and the service we love to provide and our patients deserve. The welcoming reception area is not a “waiting room”. We do everything we can to see you promptly at or near your reserved time. For the short time you are in our reception area, you are welcome to visit our refreshment area or relax in our special Dream Room. Our consultation room is a private area where you will be able to speak with Dr. Gray or one of our team members about your customized treatment. Along with viewing examples of completed smile designs, we will take time to explain procedures and fees so you feel fully informed before proceeding with your treatment. After being escorted to one of our treatment rooms, you will notice the attention we have given to making you feel comfortable. Relax in a specially padded chair, under a warm blanket, while you listen to your favorite music or enjoy our satellite TV and movies. 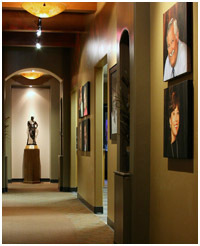 We’ve created a comfortable environment that provides you with personalized cosmetic dental care at an unhurried pace. We take our time because nothing is more important to us than making sure you get the incredible smile and treatment you deserve. The art of excellent cosmetic dentistry takes time, and we take the time to do it right. A specially designed room just for your stress relief and comfort. 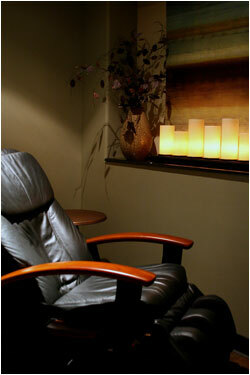 Come early or stay after your office visit to decompress and enjoy a few minutes of tranquil relaxation. A specially designed massaging recliner will gently caress your body to a dreamlike state, while tranquil music soothes your mind. Even if you don’t have an appointment, you are welcome to drop by anytime and enjoy this room along with our refreshment and juice bar.